Traveling with your new little one can either be a great joy or a tiring struggle depending on what type of equipment you use to help with the transitions. A car seat stroller combo takes care of a lot of those troublesome transitions by combining a car seat, stroller, and carrier all into one handy piece of equipment. In this article, we have listed some of the best car seat and stroller combos available on the market today. Strollers come in all types of shapes and sizes with a variety of uses. According to the Merriam-Webster dictionary, all that a piece of equipment really needs to be considered a stroller is to be a chair in which a child can be pushed. Everything else about the stroller is up to the manufacturer to decide. While strollers vary widely from brand to brand, there are some features that remain the same within smaller categories of strollers for specific uses. There are three main categories of strollers, according to What to Expect. The full-sized strollers are the most common stroller that can be seen on the sidewalks and in parks. It is built around comfort and convenience. This is why these strollers have the cushiest seats as well as plenty of storage. These strollers most often have four wheels. Four wheels are the most stable set up for strollers. With the weight of a full-sized stroller, you will probably want that extra stability. The wheels also tend to be smaller and quieter in order to drift silently over floors. These strollers can accommodate children of all sizes. The larger stroller means more space available for adjustability from newborn all the way up to toddler and sometimes even beyond. The umbrella strollers are the opposite of the full-sized strollers. Their purpose is not to offer the most to the mother, their purpose is to offer the least as far as weight is concerned. An umbrella stroller is made minimalistic in order to be lightweight and compact for travel. Due to the umbrella stroller’s design, there is not much room for extras. An umbrella stroller usually cannot accommodate younger infants. They also have less padding and storage. While this may make them less than ideal for an everyday stroller, you will appreciate the lack of storage when it comes to toting it on your back to grandma’s house or having to fit it in a weight restricted suitcase for a plane trip. Check out some of the best umbrella strollers here. Jogging strollers can also be known as sports strollers. These bad boys are made heavy duty and extreme to take on the extra jolts of running outside over rocks and potholes. They have extra suspension, larger tires, and plenty of padding to keep your little one safe. They also tend to have just three wheels as that is more maneuverable when running. Jogging strollers can be used as everyday strollers as well. If you live a very active life, you can save on storage by just purchasing one jogger instead of two separate strollers for jogging and regular use. There are some things to keep in mind when going this route. The first is that joggers are much larger and heavier than regular strollers. This may not work very well for those who live in tight neighborhoods and cities. Joggers also tend to have less storage and features. You can check out some of the best jogging strollers here. While those are the three main categories of strollers, there are some cross-over sub-categories of strollers as well. The first is the size of the stroller. A stroller usually is available as either a single or double depending on the number of stroller-aged children you have. Some specialty strollers even offer higher seat counts. You might also want to check out some of the best travel strollers. A second type of stroller is the car seat stroller combos. These are strollers that make all those transitions from car to stroller much easier. Instead of purchasing a car seat that stays in the car and a stroller that has to be folded up in the trunk, you can purchase it as one unit. As one unit, you are able to take the car seat off the stroller, giving a much smaller stroller for you to have to fit in the trunk. The car seat then has a carry handle so it can be used as a baby carrier. It then can be attached into a permanent car seat base in the car. In this way, your child never has to be removed or even woken up between the car and stroller. Car seat stroller combos come in two main styles, according to Very Well Family: the stroller frame and the travel system. To be a car seat stroller combo, the stroller needs to be able to convert from a stroller type to a car seat. The stroller converts to could fall under any of the aforementioned three categories. When choosing the best car seat stroller combo, it is important to first understand the different size and weight restrictions involved. Any infant under 6 months needs to be able to recline as their muscles are not developed enough to support themselves in a seated position. Car seat combos are able to accommodate infants as long as the car seat is an infant car seat with the correct head support and recline. After 6 months, a child can then sit in a regular stroller with little to no recline. In addition to age, keep an eye on the weight restriction of the car seat and the stroller. Both will have different weight restrictions. The stroller frame is a very simple car seat stroller combo. With this type of combo, you purchase the car seat and the base separately. This can be a more budget-friendly option than a travel system. It also allows for a little more customization. You may like a car seat from one brand, but the stroller base of another. With the proper adaptors, you are able to use the two together. The downside of the stroller frame is that there tends to be less storage as the base can be just basic wheels and metal frame. Sometimes the base may have a hanging basket between the wheels. The other downside is that the stroller can only be used as long as your child fits in the car seat. The travel system offers a little more than the car seat carrier. The stroller features a regular stroller and an infant car seat with the base. The infant car seat attaches on top of the stroller. These strollers offer much more storage space than the stroller frame. There is also no need for extra attachments as the stroller and car seat are designed to fit with each other. A travel system can last even after your child outgrows their infant car seat. The car seat can then the stored away, and your toddler can ride in the seated portion of the stroller. The downside of the travel system is that they are larger. Since they are larger, it also means it is heavier for transporting. The travel systems are also more expensive than just purchasing a car seat and frame. With the extra cost does come extra features that will make your life easier. While a travel system will normally come with both the stroller and the car seat, you are not required to stick with that specific car seat. If you decide at any time you do not like the car seat in the brand of the stroller, you can always mix it up similarly to the stroller frame. Travel systems are not always as universal as stroller frames, but if they can fit with other brands, they usually will advertise the fact. This gives you the flexibility of choice and getting the very safest and best product for your child. Car seats are not just designed to keep your child comfortable during a trip, they are also designed to keep your child safe during the bumps, stops, and any possible collisions that may occur while they are riding. This is why the proper car seat safety, as outlined by Mayo Clinic, is imperative to know when using the car seat on your car seat stroller combo. From newborn until about two-years-old, your child should ride in a rear-facing infant car seat. This is the car seat that most car seat stroller combos come with. The car seat is attached to a base which is securely attached in the vehicle. The car seat should only be in the back seat of a vehicle due to the dangers that air bags pose in the front seat. For additional safety, the car seat can also be installed in the middle of the back seat in order to keep the car seat away from doors in the case of an accident. While buying a used stroller may be fine as long as the stroller is still secure, buying a used car seat should be approached with caution. The car seat should not be older than 6 years. It should also not be damaged in any way. Always double check recalls before purchasing a used car seat. Lastly, double check that the car seat still has the original instructions in order that you are able to properly install the car seat. When the car seat is installed, double check for movement. The car seat should not have more than an inch of give when jiggled. Before placing your child in the car seat, remove all large outer ware from your child. These can prevent you from properly securing the harness tight enough. If your child is cold, you can put the coat or a blanket over the harness. When your child is properly secured, be sure the seat is reclined at the proper angle. Young infants should not be seated upright. They have not developed the proper neck and back support to hold themselves upright. Even when your child reaches the age of 6 months, when they can sit upright, they should still be reclined. This helps keep your child’s neck from being swung forward in the event of a sudden stop. The car seat should not go the opposite direction by being reclined too far either. If the car seat is too flat, then your child does not have the necessary protection that being rear-facing would have provided them. Most car seats will have an angle indicator to help achieve the necessary recline. A mirror should be installed above the car seat so that you are still able to see your child in the rear-facing car seat. After the car ride and stroller ride, your child should be taken out of the car seat. A car seat should definitely not be used as a crib for the night or even short naps. A car seat does not have the proper safety that cribs offer to keep your child’s airways open during naps. When your child reaches about 2-years-old, they can be moved to a forward-facing car seat. Some infant car seats are able to convert to a forward-facing car seat. Some are even able to go one step further and even convert to a booster seat for the later years. Most of the same rules apply for the forward-facing car seat as the infant car seat when it comes to safety. These rules include the shelf life of the car seat and the proper installation. The only difference is that there is not as much of a recline in forward-facing car seats as infant car seats. Double check your car seat’s manual for how to properly install the car seat and harness your child. Try to keep your child in the car seat for as long as the weight restrictions allow. The car seat is the safest place for your child to ride. When they can no longer fit in the car seat, then they can be moved to a booster seat in order that the seat belts will fit them properly. A child can usually start wearing a regular seatbelt without the help of a booster seat around 8 to 12 years of age. This would be when they are about 4 feet 9 inches tall. Your child should remain in the back seat and away from airbags until they are about 13-years-old. Local laws should always be checked for specific age restrictions when it comes to seating for children. While the ability for a stroller to convert to a car seat is the main feature of car seat stroller combos, it is not by any means the only feature. Flexibility is a great feature for any car seat stroller combo. You will want the option to use any car seat with the stroller if you find that the car seat that you originally purchased isn’t as safe as you thought, or your little one just can’t get comfortable. Many strollers can be flexible with the right adapters. Weight could make or break your decision to purchase a stroller. Always remember that with each feature comes more weight. All that weight will have to be carried at some point from one location to the next. Be sure it is a weight you are willing to handle. Protection from the elements is always a handy feature to look for. The bare basics a stroller should offer is some sort of visor to protect from the sun. If there is no protection, make sure your child has sunscreen, hats, rain coverage, or any other item to protect their delicate skin and health. Storage is wonderful to have with a stroller. Being able to free up your hands by placing your bags and baby items in a large basket will be invaluable. It will allow you to browse through the mall and pick up items to examine without a heavy bag falling off your shoulder. Having a cup holder for that Starbucks coffee or a water bottle will also come in handy more than you may realize at the moment. Check the wheels. The wheels can ruin a perfectly enjoyable trip if they do not function right. Look for quiet wheels that do not swivel off in all directions. Also, make sure the wheels turn easily so that you can maneuver through tight spaces. Brakes are often times available to help stop the heavy stroller when on a sudden recline. Wheel locks will allow you to take your hands off the stroller without worrying about the stroller rolling away. Safety is not so much a feature as a necessity. Be sure the stroller and the car seat follows proper safety standards with the proper support and having a five-point harness. You can look for the JPMA certified seal that shows that the manufacturer went the extra mile to have the stroller and car seat safety tested. The Baby Trend EZ Ride 5 Travel System is a full-stroller and jogging travel system that can accommodate your child from newborn until they are about 50 pounds. This stroller has many great features while still falling on the more affordable side of the scale. The stroller is available in four highlight colors along with the regular black of the rest of the stroller. The stroller is flexible as it can be used as both a regular stroller and a jogger. The three-wheel design makes it easy to maneuver if used while jogging. The wheels are slightly larger than a regular stroller to offer a little extra support, but not quite too large. As a result, this stroller should not be used heavily as a jogger, but more for casual joggers. The stroller itself offers plenty of padding for your little one. The seat has a multi-position recline. The handle is also adjustable so that people of various heights can push the stroller without an issue. Your child has a swing-away tray for their snacks and toys on the front of the stroller. Underneath the stroller is a large storage basket. The parent has their own cup holders. When the stroller is not in use, it can be folded flat. The infant car seat is made out of coordinating colors to the stroller. The carry handle has a triangular top to make it easier to carry the car seat from place to place. The car seat has plenty of head support for even the smallest infants. Both the car seat and the stroller have large canopies to protect your little one from the elements. The stroller can act as both a jogger and regular stroller. The three-wheel design is more maneuverable than others. This is a more affordable travel system option. The entire stroller is heavier and larger than some other stroller options. The stroller is difficult to fold. The stroller is decent, but the car seat is cheaply made. There is very little storage available with the stroller. The Baby Trend EZ Ride Travel System offers a good stroller for a decent price. The stroller can offer flexibility for moms who are active and do not want to spend the money or space on a secondary stroller. The main downside of the stroller is that while the stroller itself is decent quality, the car seat is lacking in quality. 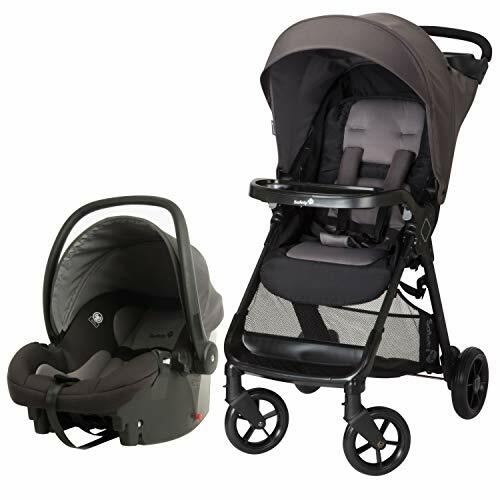 The Baby Trend Expedition Jogger Travel System is a higher quality jogger/stroller option from Baby Trend. The entire stroller seems more focused on the jogging aspect of the travel system. The stroller can hold a newborn child all the way up to about 50 pounds or 42 inches tall. The stroller comes in ten bright color options to personalize your child’s ride. The first obvious detail that is different in Baby Trend’s Expedition stroller over their EZ Ride is the wheels. 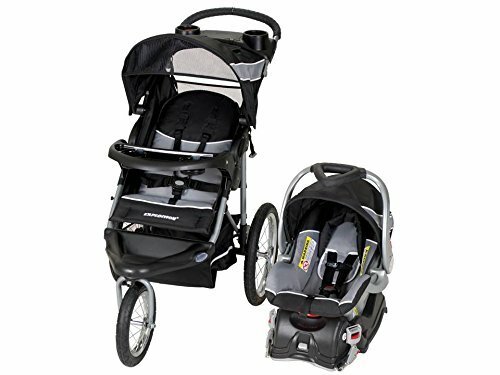 While both travel systems from Baby Trend offer the three-wheel design, the Expedition style is better prepared for heavy jogging. The wheels are larger and air-filled. The back wheels are 16” and the front wheel is 12”. The front wheel also can switch from a swivel wheel to a locked wheel. The stroller itself provides a very comfortable ride for your little who is nestled safely in a well-padded seating area. The stroller has a 5-point safety harness as well as a multi-positional reclining seat. The stroller also has a tray for your little one to keep snacks or toys on. Your child is protected from the elements by a large sun visor. The parent has a few of their own features. The handlebar is comfortable to push, plus has an added wrist tether for when you are jogging with the stroller and do not want to risk the stroller rolling away. The parent has two cup holders located by the handlebar. A peek-a-boo window is located in the top of the visor so that the parent can keep an eye on their little one at all times. A medium-sized storage compartment is located underneath the stroller. When the parent is not using the stroller, it can be folded up. The infant car seat comes with a base to keep in your vehicle. The car seat itself is made with energy-absorbing foam to provide side impact protection. It also has a Flex Lock 5-point harness. The car seat can hold infants from newborn till your child is about 30” tall. The car seat carry handle has a triangle top to allow for flexible carrying options. The jogger feature of the stroller should only be used if your little one is riding in the stroller at about 6 months. It is unsafe to jog while your little one is in the infant car seat part of the travel system. This travel system can function as a regular stroller and a jogger. The wheel set up is more maneuverable than a four-wheel stroller. The seatbelt of the car seat is difficult to attach. The handle of the car seat is hard to fold away when installing it in the car. The front wheel of the stroller tends to wobble after a short period of use. There is less storage than a regular stroller. Like the other Baby Trend stroller, this travel system receives great feedback for the stroller but hesitant responses about the car seat. The stroller is easy to use and works well for jogging. A different car seat could be considered if the stroller was what you were looking for but you also were hesitant about the car seat’s issues when it comes to usage. The Evenflo Pivot Modular Travel System provides a classic look to a modern design. The travel system can hold children from newborn till 50 pounds. The stroller is available in four different subtle colors. The stroller itself sits on four Cruiser Tires to provide a smoother ride for your little one. The stroller is convertible, offering six different travel mode options. Your newborn can lie comfortably in the carriage mode, which has the look of a classic pram: a flat rear-facing bed with a large canopy. If you would like a little more comfort and security, you can attach the infant car seat for a regular travel system ride. The third method is to bring the front down to a regular semi-seated toddler stroller. All these three options are offered facing the opposite direction, making a full six options. The stroller has many other options outside of just the multiple travel modes. The extra large canopy offers extensive protection from the elements in all the modes of travel. A large storage compartment allows you to keep any extra items underneath the stroller. The front of the stroller has a handlebar for your child to hold on to. A removable tray can be added for snacks or toys. The parent also has a cup holder for their own refreshments. The stroller folds up very slim when not in use. The infant car seat accommodates children from 4 to 35 pounds. A stay-in base comes with the car seat that can remain in your vehicle. The base includes an anti-rebound bar for extra security. The car seat has been Rollover Tested. The entire car seat is very lightweight and easy to install. The entire stroller and car seat is very lightweight. The stroller has multiple modes it can be set up in to hold your child. The stroller’s canopy is very large. The frame is very wide which makes it difficult to fit some places. The wheels do not roll very smoothly. The entire stroller is made a little cheaply. This stroller has a very unique and attractive appearance, especially if it is in the pram mode. Unfortunately, it is not the highest quality in manufacturing. The stroller can still work decently well, other than the wheel issues. The car seat tends to be a little difficult to use, but nothing a mother would not be willing to accept for all the other great features of the stroller. The Evenflo Vive Travel System with Embrace offers a regular travel system with fun designs. While Evenflo’s Pivot travel system has class and elegance, their Vive travel system has color and excitement. This travel system looks more like other travel systems. It rides on four regular wheels and comes in three bright colors and designs. Their Vive travel system is all about being lightweight and slim. The stroller in total only weighs just under 30 pounds. That being said, it can accommodate children from newborn until 50 pounds. The stroller has multiple reclining positions for the utmost comfort of your little one. A canopy shelters your child from the elements, while a peek-a-boo window still allows you to keep an eye on your child. The stroller has a tray for your child’s snacks and toys. The parent has two cup holders on the handle of the stroller. There is plenty of storage both underneath and on the back of the stroller to hold all those extra items you may need on your trips. When you need to store or travel with the stroller, it folds up to just 16 inches. The car seat offers plenty of protection for your little one. The infant car seat holds children from newborn till 35 pounds. The car seat has a convertible 3 or 5-point harness. The entire car seat has been tested at the 2X Federal Crash Test Standard to ensure that their car seats do not just meet the government standards, but surpass them. The car seat is very affordable. The car seat has gone through strict crash testing. There is plenty of storage in the stroller. The wheels are very hard to steer. The entire stroller is lower quality. The car seat does not click into the stroller as securely as it should. The car seat handle is uncomfortable and difficult to carry. This travel system is one of the most affordable options available. For those who are on a stricter budget, this stroller will fulfill all your basic travel system needs. For those who can afford a bit more of an investment, there are better quality strollers out there with the same features but a little-added security and ease of use. The Disney Amble Quad Travel System is your regular travel system designed with a Disney twist. 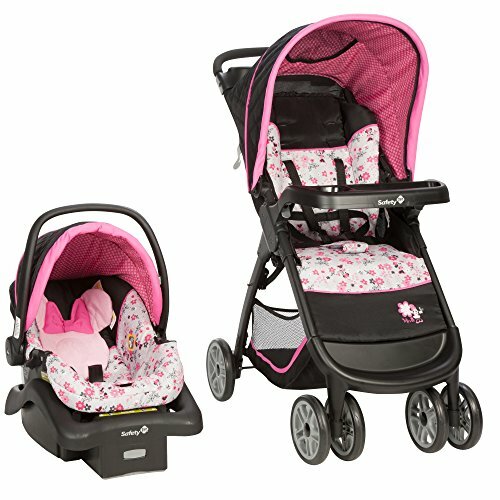 The travel system is offered in two Minnie Mouse designs and one Mickey Mouse design. The stroller has the regular four-wheel design. The infant car seat comes with a base. The stroller has a bright design that makes the stroller fun for your little one. They have a fold-away tray for their snacks and toys. There is a harness, but the harness does not have any additional padding. There is a footrest for your little to help provide extra comfort. A shorter sun visor is on top of the stroller with a peek-a-boo window so the parent can still see their little one. The parent has a tray of their own located at the handle. The tray offers two cup holders as well as a slot for their cell phone or other items they would need quick access to. Other items can be stored underneath the stroller in a large storage basket. When the stroller is not in use, it has a one-click fold option for storage. The infant car seat has an adorable corresponding Disney design with a large Mickey or Minnie Mouse located as a pillow behind their heads. The car seat only holds infants up to 22 pounds. The infant car seat quickly attaches to the stroller with only one click. The car seat is made by OnBoard 22. The stroller has some bright and fun designs to attract your little one. There is plenty of storage for the parent. The car seat is very light, weighing just 7.6 pounds. The travel system is more affordable. The entire travel system is a little cheaper in quality. The infant car seat offers very little support for newborns. The wheels are not very smooth and are difficult to steer. This travel system’s main attraction is the fun design. Those who love Disney will be greatly attracted to this adorable Mickey and Minnie Mouse design. The stroller itself is lower quality so it does have some issues, mainly in the wheels. The car seat also offers very little padding for your newborn’s head, but an insert can be purchased to remedy this issue. The Graco Air3 Click Connect Travel System lives up to its name by being light as air, if air happened to weigh 22 pounds. This makes The Air3 one of the lightest travel systems available. Along with the light-weight, it is also very sleek and maneuverable. This is partially due to the three wheel set up of the stroller. These features make this stroller ideal for those who live in the city or do quite a bit of traveling. The entire travel system can hold children from newborn until 50 pounds. The stroller has a padded 5-point harness to keep your child safe. The harness can later be converted to a 3-point harness if desired. Your little one also has the option of having a padded armrest bar. Your child is protected from the elements with an extra-large canopy. The canopy can be extended even further with an adjustable zippered extension panel. You have your own features as the parent. A parent tray provides two cup holders. There is also a zippered storage pocket for small essentials such as phones or keys. The rest of your items can be stored in a large compartment underneath the seat. When not in use, the stroller can be compactly folded. The stroller is able to lock when folded and stand on its own, making storage a breeze. The infant car seat is Graco’s SnugRide Click Connect 35 Infant Car Seat. The car seat can hold your child from newborn until about 35 pounds and 32 inches. Graco created the Click Connect system to make the transition from stroller to car as seamless as possible. The car seat base comes with the entire system. This stroller has plenty of storage. There is enough padding to keep your little one comfortable both in the stroller and car seat. The entire travel system is easy to assemble and use. The three-wheel design makes the stroller more maneuverable. The entire stroller is very lightweight and portable. The brakes on the stroller are not very reliable. While the car seat is easy to take in and out of the car, it is difficult when it comes to snapping it out of the stroller. The stroller does not have a tray for your infant. Graco’s SnugRide car seat is well-known and used by many parents. The car seat is known for being easy to use and safe. It is also very comfortable. The stroller seems well-made as well. Those who have complaints, though, tend to be pointing mainly at the stroller design. The design is meant to be lightweight and compact, which leaves plenty to be wanted when it comes to design for those who are looking for a full-sized stroller with plenty of extra features. 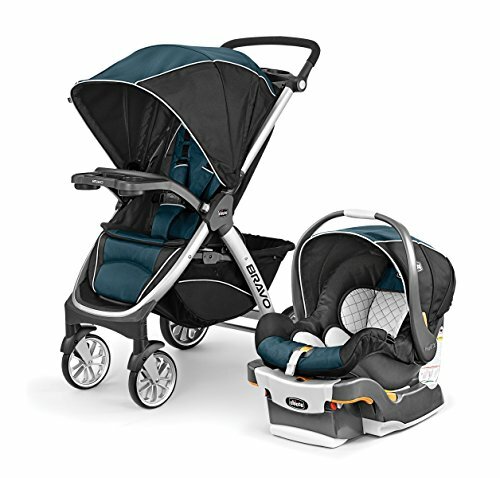 The Graco FastAction Fold Click Connect Travel System Stroller is another offering from Graco for those willing to give up the lightweight and maneuverability of the Air3 for more storage and features. While the stroller does have extra features, it still only comes in at about 30 pounds. The stroller has four sturdy wheels and comes in three different colors. The travel system can hold children from newborn up until about 50 pounds. The stroller is comfortable and easy to use. The child has a seat that is able to recline in multi-positions. For extra safety, the stroller has a convertible 3 and 5-point harness. The wheels provide a smooth and quiet ride. If the wheels ever do start to squeak, Graco recommends adding a little oil to keep running smoothly. Your little one has a full tray for their snacks and toys which can also pivot out of the way when it comes time to load or unload your child. A large canopy keeps your child protected from the elements. There is plenty of storage for the parent as well. The parent has a convenient parent tray with two cup holders. The parent tray also has easy access storage for small items like their phone or keys. There is also an extra large storage compartment underneath the stroller for additional items. The stroller features a fast-action fold up when not in use for easy storage or portability. The car seat is Graco’s SnugRide Click Connect 30 infant car seat. The car seat comes with a stay-in-car base. The car seat can hold children from newborn till 30 pounds. The padding in the infant car seat can be removed and machine washed between uses to help keep it clean for your little one. The stroller and car seat have plenty of padding and support. The stroller has plenty of storage. The stroller and car seat are quick and easy to switch between. The canopy is difficult to adjust. Smaller infants may need additional head support for the first few months. The padding for both the stroller and car seat is less than other brands. 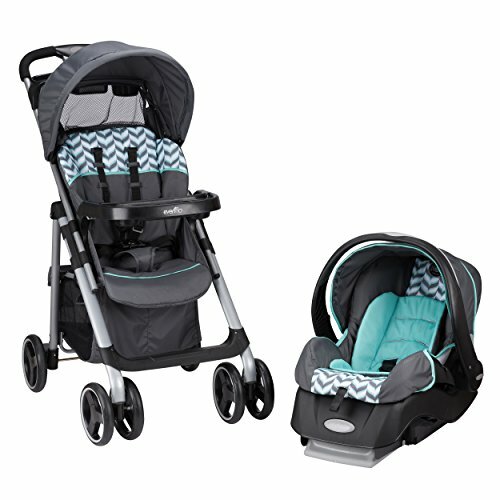 Graco’s strollers are a middle of the road option for parents who are looking for travel systems. They are easy to use with pretty decent quality all for a very reasonable price. Many parents do not want to be spending hundreds on a stroller they will only be using for a short time. In this way, Graco will meet a parent’s needs. Because it is a middle of the ground stroller, there are some areas where the quality is not the finest and comes across more plastic than a sturdy stroller material. The Safety 1st Smooth Ride Travel System with OnBoard 35 LT Infant Car Seat is a travel system whose main goal is to provide the safest experience for you and your little one. Their travel system is very simplistic in appearance but still offers many similar features as its more expensive counterparts. The stroller is available in three different colors. The stroller has four wheels that easily go around corners. The entire travel system can hold children from newborn until about 50 pounds. The Safety 1st stroller is soft and comfortable for your little one. They are nestled inside with a 5-point harness. Your little one also has a tray for their snacks and toys. A large sunroof with a peek-a-boo window keeps your child protected from the elements during your outside excursions. There are features that will make the parents glad about the stroller as well. There is two storage option for your stroller. The main storage compartment is an extra-large basket located underneath the stroller. A small parent tray is located by the handle. This tray contains two cup holders and a compartment for keys or phones. The brakes on this stroller are made easy enough that they can even be used while wearing flip-flops. When you no longer need the stroller, it easily folds up with a fast fold one-handed lift. Once it is folded, it will stand on its own. The car seat is focused on safety. It is the onBoard35 LT infant car seat. It can hold children from newborns all the way up to 35 pounds. There is extra newborn support with added inserts. The car seat has side impact protection. It is also lightweight so that it is easy to carry when used as a carrier. It follows all the safety standards of the ASTM. The car seat easily goes from stroller to stay-in-car base through the QuickClick attachment. The stroller is very easy to fold up with one hand and stands on its own. The brakes are easy to use, even with flip-flops. There is plenty of storage around the stroller. The handle on the carrier is not comfortable to hold for long periods of time. The sun visor is difficult to use. The wheels are not very good quality and result in many bumps and jolts for your little one. The Safety 1st Smooth Ride Travel System is another middle of the road options for those who did not like Graco’s travel system. The features are very similar to other travel systems in the way of storage, trays, and folding options. Because this travel system is not the most expensive option, the click connections and other features do not always work as smoothly as advertised. For the price, you receive a good deal for those who do not want to spend too much on a travel system. The Britax 2017 B Agile & Safe 35 Travel System is one of the more expensive options, but for good reason, as it has plenty of comforts and is easy to use. The entire travel system has a very sleek and narrow design. There are just three wheels so that you will have plenty of maneuverability. The travel system comes in five different bright colors. The entire system comes in at just 28 pounds. The stroller is very easy for you to use, as well as comfortable for your little one. It offers plenty of padding as well as a 5-point harness. There is an extra-large storage compartment underneath the stroller seat for any extra items you may want to take with you on your trips. A large canopy protects your little one from the elements. 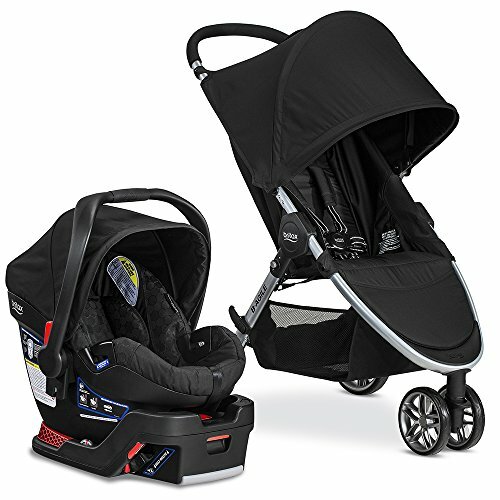 The unique design of the Britax stroller allows it to connect to any Britax car seat of choice so that you can be sure you have the best car seat for your needs. When you do not need the stroller, it can be easily and quickly folded up with a one-handed fold design. The car seat has superb protection all around. Both sides have side impact protection through a foam-lined shell. The base is an impact absorbing base to lessen any impact that may occur while your child is in their car seat. The car seat itself is designed very slim to fit in most vehicles, while still nestling your child comfortably inside. Attaching the car seat is a breeze with the quick SafeCenter LATCH. It both attaches and adjusts to the perfect settings. The car seat has plenty of extra protection features to keep your child safe. The stroller and car seat are slim to fit easily anywhere they may need to fit. There is plenty of padding to support your little one. The travel system is very quick and easy to use and transition with. This is one of the more expensive travel system options. There are no extra storage or cup holders for the parent. There is no child tray. Britax has definitely created one of the best travel systems in terms of quality and safety. Their car seat has gone above and beyond all safety standards. The best part is that it is all so easy to use and adjust. The higher price is definitely reflected in the better quality. Just be aware that there are very little extra features like cup holders or trays that come with the stroller. Their main focus is more on safety and quality than extra accessories. 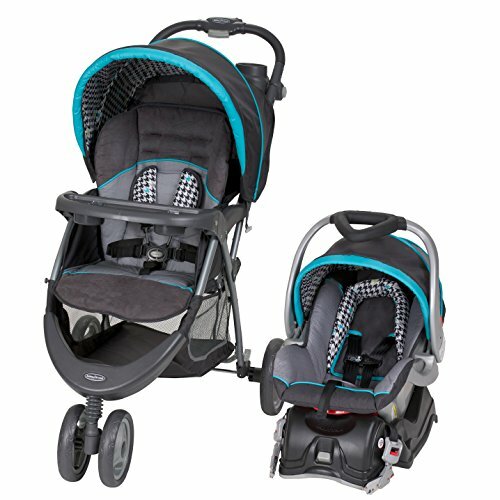 The Chicco Bravo Trio System is a similarly priced travel system to the Britax travel system. 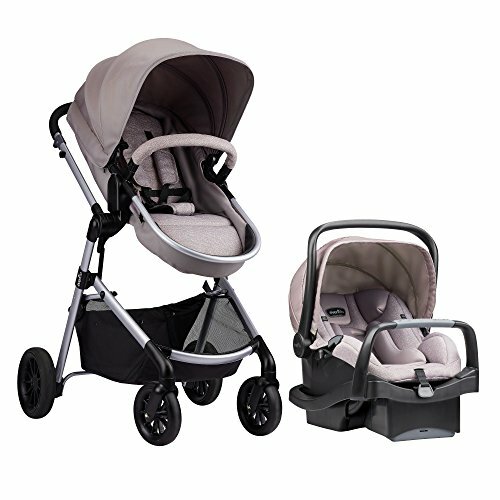 With this higher price also comes higher quality and some great features to make using this travel system a breeze. The stroller comes in four different colors and patterns. The travel system can hold your child from newborn till 50 pounds. The stroller is well designed with larger wheels to help ease over any extra bumps. There are four wheels for extra stability on the stroller. Your little one is safely nestled inside the padded stroller with a padded 5-point harness. There is also a footrest for extra comfort for your little one. Your child has the choice of either an armrest or a tray for their snacks or toys. An extra-large canopy protects your little one from the elements. The stroller is very easy for the parent to use. The handlebar adjusts to various heights so that multiple people can use the stroller. The parent also has a handy parent tray by the handlebar that has two cup holders and extra storage for small items like a phone or keys. The main storage compartment is a large basket located underneath the stroller. An easy-to-use brake is conveniently located behind the wheels. The entire stroller is very easy to fold and will stand on its own. The Chicco Bravo Trio system uses the Key fit 30 infant car seat and comes with the base. The car seat offers plenty of padding for even newborns. The car seat can hold an infant up till 30 pounds. The harness of the car seat can easily be adjusted with a one-hand pull system. The entire shell of the car seat is lined with foam to absorb energy in the case of a collision. The base has a LATCH system that makes installation a breeze. The materials of the car seat can be machine washed between uses. The stroller has plenty of storage options. There is enough padding to keep your little one supported. The system is very easy to use and install. There are quite a few extra safety features. The fabric of the car seat tends to cause some infants to sweat. This is a more expensive travel system. The entire system is rather heavy. Chicco’s travel system is a higher quality travel system with all the necessary features plus a few extra safety features for the extra peace of mind. With all the padding and features comes a little extra weight compared to some other travel system options. Car seat stroller combos are a great way to ease that transition from house to car to the destination. While some products are as easy as considering the quality of the product, travel systems are a little more difficult to settle on the best product. The main reason being that you are actually examining two separate products: the stroller and the car seat. Many travel systems offer a great stroller, but an unsafe car seat. Others offer a very comfortable car seat but are lacking in the quality of the stroller. When it comes to your child’s safety in the car, a little extra investment may be necessary to get the best quality car seat for your child in addition to a stroller with helpful features. The Chicco Bravo Trio System offers both an extra safe car seat and a handy stroller with all the extra features that make life easier from trays and cup holders to extra storage. This is why the Chicco Bravo Trio System is the best car seat stroller combo.